We’re a rag-tag group of people vigilantly pursuing self-sustaining educational & employment opportunities with and for students and their families living in rural communities in developing countries. We believe in asking hard questions like, “What do you need and how can we help?” We believe that communities know their needs better than we do and that it’s our job to listen. We’re big on being kind for the sake of kindness and we believe that even the smallest acts of kindness can make a big difference. We believe in keeping vigil over one another and watching for opportunities to help, no matter how far off the beaten path those opportunities take us. We’re vigilant in our belief that God has given each person unique gifts and that one of the highest forms of worship is using those gifts to serve others. We believe God has a purpose for each life and Vigilante Kindness is our purpose. Join us as we live out wild adventures in service of God and others. Join us in committing acts of Vigilante Kindness. It is October 31st, known to most as Halloween, but known to insane writers everywhere as the night before NaNoWriMo. That’s right, National Novel Writing Month is standing tiptoe at my door and I am, at best, unprepared. Last year I did all sorts of things to prepare for a crazy month of writing. This year I have done nothing. Last year my plot came to me in a dream. My dream life has been overactive as usual, but nothing worth putting on paper. In short, I am skint. Last year I was a NaNoWriMo winner, meaning I cranked out 1,667 words a day for 30 days for a total of just over 50,000 words. I’m not saying they were interesting words or that my novel was any good, but I crossed the finish line and that’s what counts. In cycling there is a term for people who do not cross the finish line. It is DNF, as in Did Not Finish. It is the most shameful of acronyms. I know this because I DNF’d once. After a nasty sports drink incident, I found myself puking in front of scads of teeny tiny soccer kids, but even that was not as embarrassing as the DNF that appeared by my name. I am confident that with your help I’ll be able to pound out 50k words by November 30th and instead of a horrid DNF appearing by my name, it will instead say WINNER. There’s a certificate and everything. Clever move, Alicia. I’m at an equal loss. Hm…what to do, what to do..
Place: Ord Bend. Dubuque. Winnipeg. Name: Sophie. Cousin Charles. Alfie. Pet antics: The 50 pound Penny, a wiry mutt who thinks she is a lap dog and climbs onto any empty lap she sees. Follow the Vigilante Kindness Blog. Enter your email address to follow Vigilante Kindness and receive notifications of new posts via email. 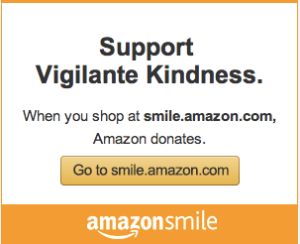 Shop at Amazon Smile to Support Vigilante Kindness. SOLD Paintings. Thank you for supporting Gulu artists! May 14, 2016: Alicia will be speaking at Writers Forum from 10:30-12:30 at All Saints Episcopal Church in Redding, CA. Guests are welcome. To book Alicia to speak to your group, please contact us at vigilantekindness@gmail.com.